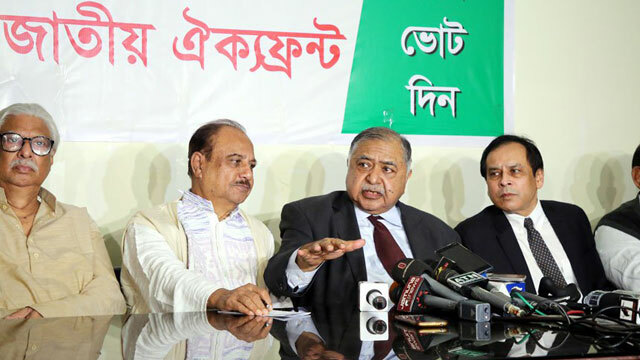 Dhaka, Dec 5 (Just News): Jatiya Oikyafront leader Dr Kamal Hossain yesterday urged all, including the media, to stay alert about any move that could hamper an impartial and credible election. The Oikyafront will unveil its polls manifesto by Saturday, he said while talking to reporters after inaugurating Oikyafront's office in the capital's Bijoynagar. The government is now in “uncertainty” about the election as the Oikyafront decided to participate in the polls, said Kamal, who did not elaborate further. “They [government] thought they would be in power for five more years through an ordinary election as we're not prepared for it. When we declared that we would take part in the election, we saw uncertainty was created among them,” said Kamal, also president of Gonoforum. Kamal, one of the architects of the country's constitution, said, “People, who are the country's owner, have no control over it at present. That's why unelected people became lawmakers. We've long been waiting to get rid of it and an opportunity has come up to restore people's ownership through the election. He called upon journalists to let people know about violations of electoral law and “unlawful and biased role” of the government officials and law enforcers. “I think you [journalists] can guard people's voting rights. If you remain vigilant, we'll be able to realise people's demand for a free, fair and neutral election thwarting the government's all evil efforts,” Kamal opined.